Grinches be warned: I am a Christmas elf who begins celebrating Christmas at the earliest moment possible. Christmas music is currently on repeat, candles are burning, my mini tree is up in my bedroom, gifts are being ordered as I type. So I’m pretty sure I’m one of the the poor Target employee’s least favorite people this week. I’ve already been in Target twice this week scavenging the first round of Christmas decor. As they’re attempting to set up the holiday decorations, I’m dodging in and out of aisles staking out the selections. Yes, I am that person! And I’ve already made several purchases and began decorating! This is going to be quick and to the point, but I wanted to hurry and get a post up for you guys to share my top picks from the first of Target’s 2018 holiday decor! Everything has just released, but I have a feeling the best of it will sell out fast! Because there are some great items this year at even better prices! Alright let’s get into it…. Oh myyyyyy gooodnesss!! I am OBSESSED with these adorable little glitter bottle brush trees! You can find them in the Target Dollar section, the small ones are $1 each and the larger size are $3 each! (Or order online! 3 larger trees for $9 or 8 small ones for $8!) I bought a bunch and I’m already considering going back to get more. These simple little trees seem to never go out of style and the price on these is the best I’ve ever seen! I have a feeling these will disappear from shelves REALLY fast. I was genuinely surprised at Target’s stocking selection so far this season. They had a TON of adorable options and most were pretty reasonable in price! All three I’m linking below are $13, not too bad! One of my favorite parts of Target’s holiday decor is their mini tree ornaments and decorations! I have a mini tree in my room and snagged this adorable $10 tree skirt for it this year, it’s SO cute. I’m also linking the full size version! I bought this $8 glitter reindeer already! It comes in 5 colors and is the perfect size to sit on a desk or coffee table. I’m also loving the mercury glass trees I’m linking below! Also come in several colors and 2 sizes. Alrighty friends, back to decking the halls I go! I hope I could help give you a few ideas for your holiday decor this year! I can’t wait to share more soon. 364 days of the year I am a neutrals girl! I swear nearly everything I own is gray. But on Christmas I love to add a pop of red or green into my wardrobe and this gorgeous lace top from Target is perfect! I love sheer lace tops like this one, the gorgeous design of the lace adds such a unique vibe to the look. But what I love most about this top is the sleeves! Bell sleeves are having a major moment in the fashion world right now and I am loving it. 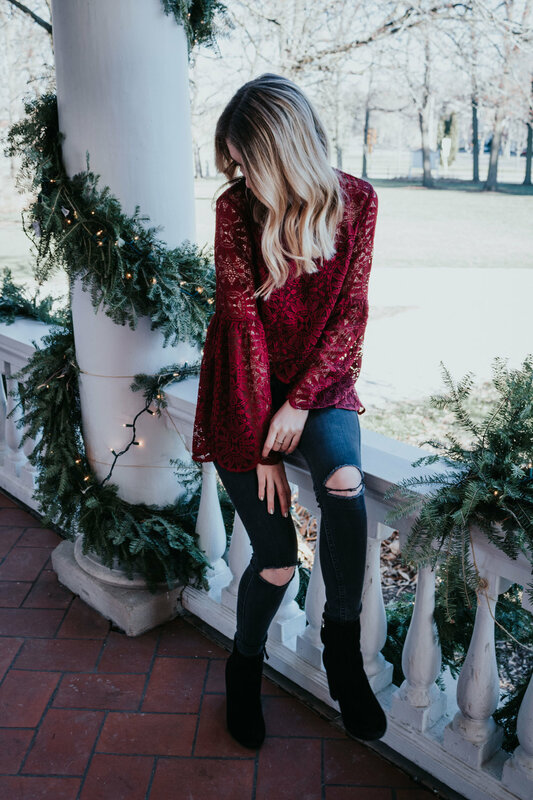 You can style this type of top a million ways, but simply paired it with a pair of comfy black skinnies (perfect for sitting on the floor opening gifts) and my favorite black midi-boots. For accessories I went minimal with some oversized gunmetal hoops, but you could totally rock a statement necklace with a look like this too. Mark's half zip sweater is one of my favorite things in his closet! Whenever we have an event to dress up for we both immidately reach for this speckled sweater! Sweaters like this are great for the holidays during chilly weather, they'll keep your man comfortable and warm, while still looking darn good! Mark chose to simply wear a nice pair of dark wash jeans and pulling the look together, my fav men's dress shoes ever!! I love the red-brown tone of these shoes and the details in the stitching, they look so much nicer than your basic pair of black leather loafers. I hope this post can help give a little inspo as you're putting together your outfits for both you and your SO this weekend! Have a very Merry Christmas you guys!!! 1. These Gucci Dupes are some of the most comfortable shoes I have ever worn. They feel just like slippers, but I can wear them to work!! Plus they come in a gorgeous blush shade too! 2. I've had my eye on this mug for months now, maybe it will be a little gift to myself this holiday season! It's just so cute, for obvious reasons! 3. This chenielle blanket looks so cozy and cute! I love the specked pattern! 4. I love this Pixi highlight, and the brand overall! This little gift set is a great way to try out a few products from one of Target's more expensive beauty brands. 5. I'm OBSESSED with Sugarfix by Bauble Bar, they have cutest, most on trend jewelry for wayyy less! I have these beaded tassel earrings in a couple colors and wear them all the time. All the Sugarfix holiday gift sets are great deals and super cute, but these grey/pink earrings are my fav! 6. I've put these Rockland suitcases on my christmas wishlist this year! Firstly, because I need a new suitcase, but mostly because this champagne shade is so gorg. Plus, they're pretty affordabe!! 7. I love this little pink crossbody! It's identical to a Steve Madden one I have had for years! Comes in several other colors too, but obviously I picked pink. 8. I can't and won't stop raving about this crazy cozy sweater! It's so soft and goes with any outfit! Plus they just added new colors (blush pink & forest green!!! ), makes a great gift for all your gal-friends, or yourself!! It's currently on sale for $25! 9. I'm about to order this adorable letter board!! I've been seeing these everywhere and love how you can add your own quotes! There's also a grey frame option too! 10. I've had my eye on Target's Sip by Swell waterbottles for quite a while! They are said to be such good quality and I've been loving their holiday editions! Hope you guys loved this first gift giving guide!! I have tons more to come! Are there any themes/categories you want to see a guide on!? Leave them in the comments below!